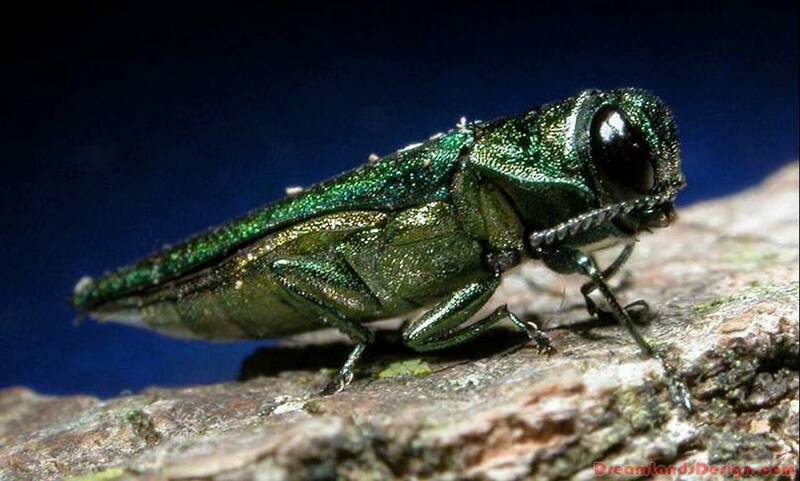 One of the predominant enemies of Ash trees in the United States and Canada is a metallic green bug known as the Emerald Ash Borer. Found in 14 northern states and parts of Canada, this green beetle is a major threat to Ash trees and causes in excess of three billion dollars in damage every year in the U.S. alone. About the only way possible to protect Ash trees from significant damage is to hire tree care service professionals. One of the most effective tree professionals specializing in the Ash Borer infestation is the Emerald Tree Care Company, which has 3 locations within the U.S. They are committed to the protection of trees and offers service and treatment that will keep your trees from harm. In 2002, this highly destructive tree pest beetle was identified. Experts believe that it might have entered the country at the conclusion of the 1990′s. An infestation may take as long as a year before it is visually noticed on a tree. By the time the infestation is discovered the beetle has done great damage and is very hard to destroy. One sign of beetle attack are holes shaped like the letter “D”. If the attacks are ignored or undetected, the tree eventually dies. The Emerald Ash Borer damages or kills off more than 40 million trees in the United States. Companies in the tree care business use the most recent chemical insect spray to rid the Ash trees of the beetle infestation. Often, the trees will have the chemical treatment directly injected into the tree itself. These holes used to the injections are then sealed up so they are not injured or harmed. The chemical treatment on one of these trees usually protects it for a couple of years before requiring another treatment. Not all of the treatments for protecting Ash trees require drilling and then injecting the chemical, however this method is the most effective of all. If you own an ash tree, one insect in particular can be very damaging, and it is important that you know about the potential threat. It is estimated that the EAB, or Emerald Ash Borer has detroyed millions of ash trees across the United States, since it first appeared. The species of beetle originates in Asia, and has been blamed for the infestation and destruction of many trees all over the country. Most of the damage to the trees is caused by the larvae eating the inside of the bark, although adult insects can also damage the tree by eating the leaves. The tree eventually dies from a lack of water and nutrition. The destructive insect first appeared in Michigan, in 2002 and in several other states soon after. In the ten years since then, the beetle has spread to various other states, stretching from Tennessee to New York. The large scale destruction has also been costly, in addition to getting rid of tens of millions of ash trees from the landscape, and scientists have understandably been researching ways to stop the destruction. Some counties have been somewhat successful in preventing further infestations, by imposing a quarantine. Knowing how to spot and prevent an infestation of the ash borer insect is essential, whether you are working in farming or forestry, or are a private home owner. One way to educate yourself on the destructive and annoying emerald ash borer is to contact the Emerald Tree Care company, who can help you to save your trees. Ecosystems maintain a delicate balance. Any disturbance to this, no matter how small, can lead to disastrous effects. Take for instance the case of foreign insects being accidentally introduced to an otherwise thriving environment. Even if just a handful of these insects are present, they could multiply at a rapid rate and cause billions of dollars in damages. This is exactly what happened when the Emerald ash borer that is native to Asia got on US shores. The adult Emerald ash borer is quite harmless. The real cause of concern among scientists and industry stakeholders is the larvae. After hatching from the egg, the larvae burrows into the host tree and feeds off of its xylem and phloem – the carriers of water and nutrients. By removing the tree’s capability for sustenance, the larvae effectively choke and kill the host over time. Although the Emerald ash borer does not travel very far by itself, it has spread across numerous states due to the transport of firewood. This has led to laws that strictly monitor the movement of wood to prevent further damage and contain the problem. Ordinary citizens can help by using locally-sourced firewood for their heating needs. This minimizes the demand for imports from other states which may be cheap on the surface but can cause great destruction, leading to loss of jobs and livelihood for many. Another thing that can be done is to proactively treat any tree that may be suspected of an Emerald ash borer infection. There are methods in which the larvae are specifically targeted. One of the best companies that provide this service in the Michigan area is the Emerald Tree Company. It has experts that can survey the situation and determine the most appropriate response, so there is never a need to worry about the Emerald ash borer infestation again.